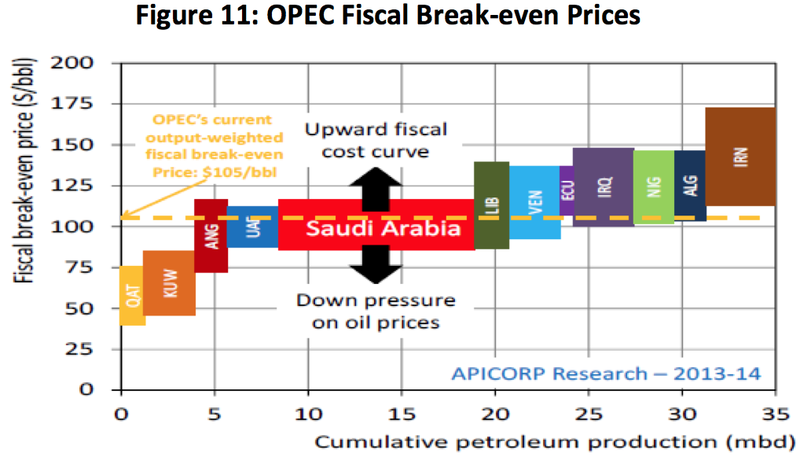 So you think the US want’s to curtail Venenzualia’s oil production to raise prices? 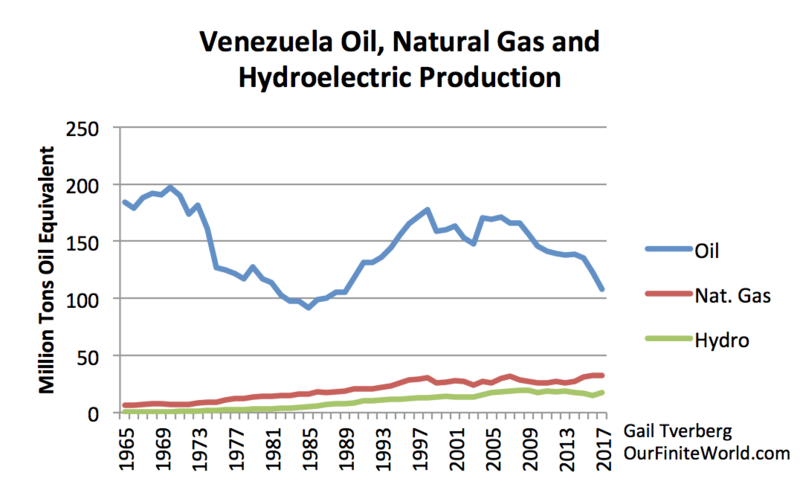 Venenzualia oil production was already in decline so if that was the goal of the US, all it had to do was, nothing. I suspect the real reason it wants Maduro out & Gwido in is that US fracked oil production will soon tank, the value of stocks of fracking companies is crashing, they have been losing money for years & paying dividends by borrowing, but if the banks won’t lend them more $$ & investors stop investing in a losing enterprise, production from fracking will collapse & oil prices will rise, temporarily if the economy can’t support those higher prices & past high oil prices proved it can’t. Also Venenzualia’s oil is very heavy but it can be upgraded with light fracked oil to produce transportation fuels that the OIL powered, US military empire needs. I guess the US empire doesn’t think that Venenzualia’s economy isn’t collapsing fast enough so it’s forcing it’s collapse so it can install it’s puppet who will then allow US oil companies to take over Venenzualia’s oil fields, ship it’s oil to US refineries so it can upgrade it with it’s fracked oil. That move will probably stall our collapse. This looks dead on, excellent analysis Sheila, thank you. Interesting to see what Gail says, perhaps I’ve missed something.. I think so too. 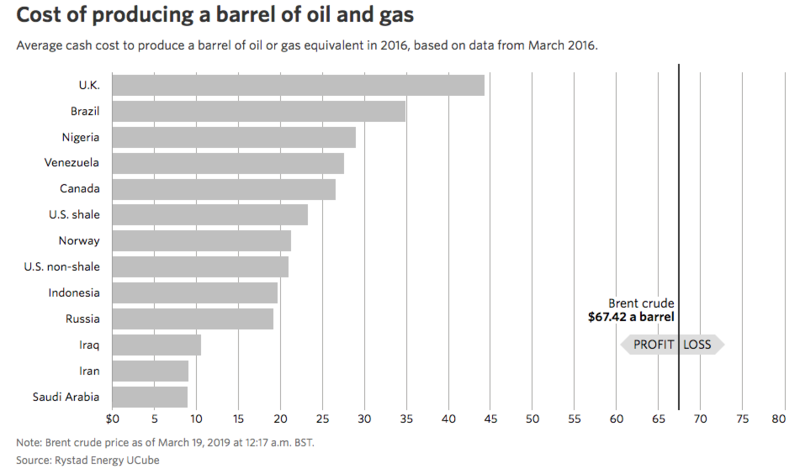 I did read that Venezuela’s oil cannot be fractioned in Venezuela. No plants were allowed to be stationed there[?]. This means that for petrol and kerosene etc Venezuela has to import it all for domestic consumption. That certainly doesn’t help. I wouldn’t blame socialism. You have to blame the management of it, often highly incompetent. The USA is partly socialist, what I call ‘small S’ socialism. The Military and the police are included as well as social security ,infrastructure and education and healthcare. These are partly privatised at great cost to the nation, now looking decidedly third world, because of it. At least when you call the Police they don’t have to ask you for your credit card number. In my part of the UK, Somerset, the police don’t even turn up, they are so laid back. But I must admit that crime is somewhat limited here. Here in police states of america I’m more intimidated and fearful of the police than criminals or crime. In fact when you factor in taxed to pay for them to act like an occupying army they have taken more from me than any criminal ever could. Wow, I have read about the cops in USA but didn’t really believe it was that bad, Dan. What a terrible state of affairs. I tend to agree with this as well and some who follow the geopolitics surrounding Venezuela say pretty much the same thing. The rolling (US sabotage) blackouts and US sanctions have crippled Muduro’s country. There are also reports that there is plenty of food in the country and that most have gone to a non meat diet becuase it’s too expensive. No, 20 years of ham-fisted socialism crippled the country. The (very recent) sanctions are just the final nail in the coffin. The rolling blackouts were already a thing several years ago. They’ve just accelerated in frequency more recently. The Venezuela situation is right out of the playbook of John Perkins “confessions of an economic hitman”. 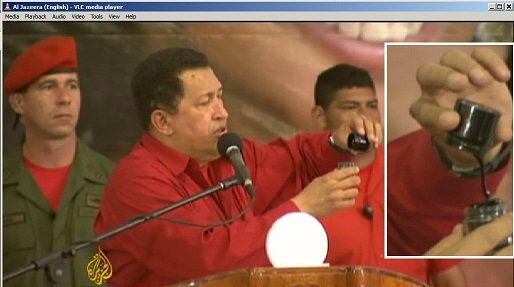 Yeah I see the USSA’s fingerprints all over the Venezuelan crisis. I stopped listening to the USSA with “that Saddam Hussein has WMD’s. Fool me once, shame on you, fool me twice shame on me. Saddam was a madman. He had plenty of chemical perhaps some biological. Chemical used both in iran iraq war and on civilians the kurds. No one liked Saddam. While the shia didnt have us kissing babies like we thought saddam was hated. Most of the Iraq military didnt put up a real fight. The ones that wernt decimated. Saddam had to go. Do you honestly believe Iraq is better off today than before we invaded? Can you explain to me if the region is better off and why? While you shed your tears over chemical attacks (which is atrocious) think about the tons and tons of depleted uranium we have littered Iraq with from our munitions. I really want your answer here on how Iraq is better off – I’ll grant you SH was an ahole but having your country invaded and occupied by a power that wants resources is no picnic either. Absolutely agree Rodster, you are so right to distrust Amercia. IMO they are losing credibility daily. When I read John Perkin’s book I was reminded of another one I read a long time ago but cant remember the title. It was about all the false flags initiated by USA over the years. I remember the ‘Tonkin’ incident and Northwards proposed operation on Cuba, but little else. Very recent…since 1994… guess thats a blink in geologic time but it forever when it comes to financial terms. VZ has suffered the modern equivalent of a medieval siege at the hands of the US regime. But the US regime grows impatient, as they did with the Syrian govt. I do believe that the US regime has a lower voter ‘legitimacy’ than the Maduro Govt? 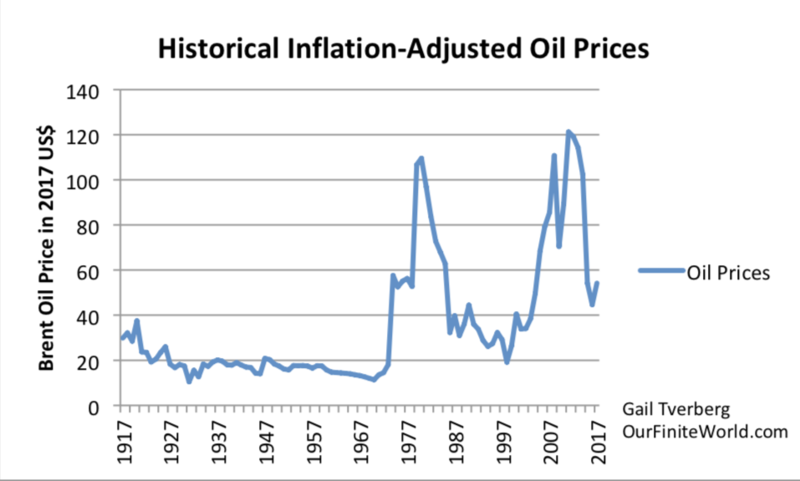 The US needs higher oil prices now. The US saying that it doesn’t plan to raise interest rates has pushed the US dollar down, making the US’s oil prices higher. But it could use even more uplift to the dollar and the price. Waiting for Venezuela’s production to fall would be to slow. Also, the country would tend to fall apart as its exports drop. Doing something before everything falls apart would, in some sense, be optimal. Otherwise, the oil production from Venezuela is permanently lost. In fact, it may already be permanently lost, because the electricity system is in such terrible condition. I don’t know how the US will do this. I think it will take more than US oil companies going in. There has to be a huge investment in electricity, as well, for example. I am not sure anyone has thought this through. A puppet government can’t really fix the problem, IMO. Could Nuclear Power hold the answer? Its reactions pound per pound has a higher energy density after all? Could it be the holy grail to all this? I see China is investing heavily into Nuclear Power research. And even Saudi Arabia too is investing in Nuclear Power. Should help kick the can down the road at the very least in your scenario, at least until we run out of fission fuel. Greetings from the Big Mango (Bkk). Thanks Gail, for a very credible alternative View. It also highlights the significance of large debt collapse. With the coming decline or choppiness in production you indicated last post, would you anticipate the US taking the oil industry under National control? They would then make sure the military got their cut first and the rest of us got Ration cards. Countries normally take over oil companies in order to gain revenue from them. Taking over money-losing operations, when the US is already having debt problems, doesn’t sound like an option most would favor. Also, it takes a whole lot of specialist to run an oil company. They have to be paid big bucks, in order to work. This also isn’t something that the US wants to get involved with. Good analysis but I’m confused about the references to the US being in control or having the ability to decide how export revenues are used. Could you expand a bit more on that? The United States is Venezuela’s biggest trading partner, both for exports and imports. 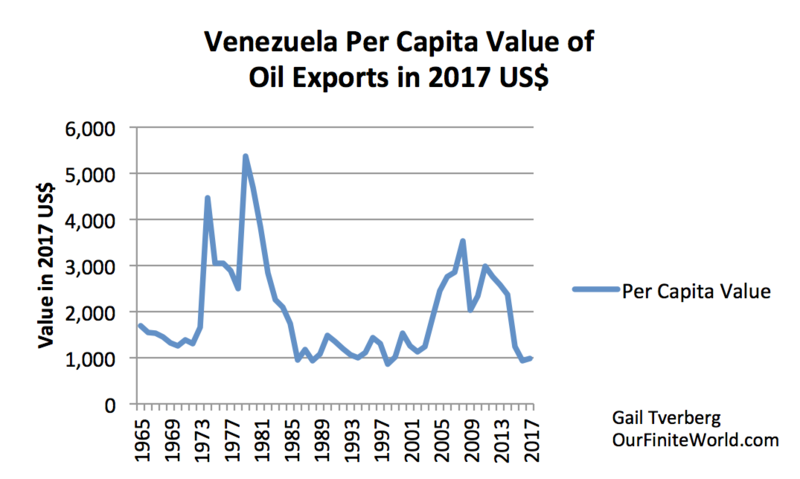 If the US “cuts off” Venezuela, it is in tough shape. It doesn’t need to send in military. Thanks, Gail. Well, the US could certainly wreak havoc but I’m not sure that equates to being in control of the situation or being able to dictate how Venezeula’s revenues are used. The Venezuelan economy is already on the edge of collapse. Having its biggest import/export partner cut it off would likely push it over the edge. Also, a portion of its exports are already pre-sold to China, and perhaps some to Russia. The US would try to cut them out of the deal. As long as they take part of the total, Venezuela is definitely headed for collapse quickly, even without US actions. If the US can cut out China/Russia, that would leave more for the US and the Venezuelan people. “…[UK North Sea] drilling activity is at a “record low rate” and supply chain firms remain under “significant financial stress”. Interesting! More money-losing oil operations. Anyone want to take this over? As .no controls ~ $750B portfolio in their wealth fund, they can easily ‘borrow against’ that and subsidize the energy – extractive industries for many years to come. Again, lets repeat the fundamental key change, since ~2008 aftermath the question of debts, deficits, and negative yields does not matter anymore. It’s simply a new paradigm VISIBLY agreed upon and performed daily by the CBs, govs, and biggest private stakeholders GLOBALLY. It’s the (very?) last stage of the unchained credit system going back to late 17th century (in the global sense). We have to wait till serious political realignments occurs due to ECoE prosperity impoverishment (unlikely) or real physical shortages intervene first (more likely). But at that edge cliff point the chaos would be unbearable for most to cope with the situation anyway.. so why bother. Actually, even the upper management level people like Macron know that very well, (evidently several PO/surplus energy aware advisers on various gov panels) so why not having a ski holiday during ongoing protests in Paris.. good live continues..
And again similarly, only now some of the French unions are in lukewarm fashion proclaiming they might consider to join in and mount general strike. But obviously it will be watered down version of that, not true decisive attempt like blocking refineries or other core JITs. They just want some new version of socialist policies in place and go home. You see it’s a very slow process, nobody is rushing anywhere as long as food and games are somewhat a plenty. It’s human nature, it’s biology, there is still lot of stuff to be burned on the altar of consuming society even when we likely reached the no growth bumpy plateau..
“…it doesn’t take a catastrophe like war or drought to disrupt [food supplies]. In Venezuela, a country blessed with rich oil reserves, a political crisis driven by rocketing inflation has led to shortages of food and medicine, forcing families to live off rotten meat and leading millions to leave the country all together. The Eurozone crisis that sent Greece’s economy to the brink of collapse also brought food shortages to the struggling country. “Meanwhile, disease, poor weather and rising prices have led to shortages of a number of popular crops in recent years. Soaring rice prices led to panic buying in the Philippines and other Asian countries in 2008, causing a supply crisis for this staple food. Bad weather in Europe in 2017 saw prices of many vegetables rise while there also were worldwide shortages of avocados after several countries were hit by poor harvests. Many thanks Harry, that is a remarkable article; so much so, that I have included it as a footnote in my book. It really does show how people draw together in times of adversity. I remember the 2000 fuel crisis in UK. I was in a supermarket and witnessed an elderly gentleman ahead of me with a basket containing 2 loaves of bread (the shelves were empty). He turned around to get something from a shelf and, whoosh, the bread was gone and a young person was rapidly disappearing down the aisle! A salutory lesson for me who tries to think the best of people. “…in the UK in 2000, when the UK Home secretary Jack Straw accused the blockading truckers of “threatening the lives of others and trying to put the whole of our economy and society at risk”. This was not hyperbole. As the protest evolved over about ten days, the UK’s Just-in-Time fuel distribution system started to break down. After the 2011 London riots, supermarkets and other stores in those areas cut their stock levels down even further. Harry, you are a wonderful source of amazing information, many thanks for this one – again I can use it in my book (Part 2) WIP at present and due to be released later this year as the crisis develops. Part 1 – 3rd edition is in the final stages ready for publication in H2 – 2019 (When Brexit is finalised or NOT! Best regards. Bless you for the kind words, Peter. I hope you hold and show the evidence to prove otherwise, Norman, for they know not what they talk about. My book contains many examples. No surprise. In Bilbao these days the immigrant criminals actually specialise in robbing the weak and elderly – they never go near their equals in age or strength. In London, my very elderly mother had to endure a house raid by 4 large men, just hours after I’d left her. My goodness – how horribly traumatic, Xabier! Did they catch them? And was she able to continue living there afterwards? £10,000 in cash gone,and all her jewellery, some 200 years old and very sentimental. They wore vests with pockets into which the loot went, no bags. I suspect an awful lot of elderly people have stashes of cash,and these people must make a very good living: only 10% of reported crimes get to court as you know. For anyone interested, the initial scout was – as far as I have pieced it together – someone who hung around the street and pretended to be a building worker with tool box, always on his phone. This was one month or so before the robbery, and my mother – who is very intuitive – thought he was dodgy. Won’t happen in your island paradise, I’m sure. IMHO, Xabier, it happens all over the world. I spent 10 years in Cape Town and this ploy was so common with the blacks that we always had to take notice when buidling work either private or public was going on. I learned to be very canny during those years having come from innocent UK, which looks as if it’s going this way too. It was never a problem in the 1950s, but that was a more civilised time I believe. Well, we have had some instances of gas canisters being nicked recently, although suspicions as ever are directed at mainlanders, particularly the travelling folk who like to come here and do a spot of coursing. Sorry to hear that. It can leave emotional scars for life. As a trained humanistic counseller I have come across many examples of these sad cases. I am hoping that under the New Emergent Economy following GFC2 as described in my book, people’s attitudes will change, more like they did during the war here in UK. Superb article Gail. Have to go to work now, will comment more later. Thanks. 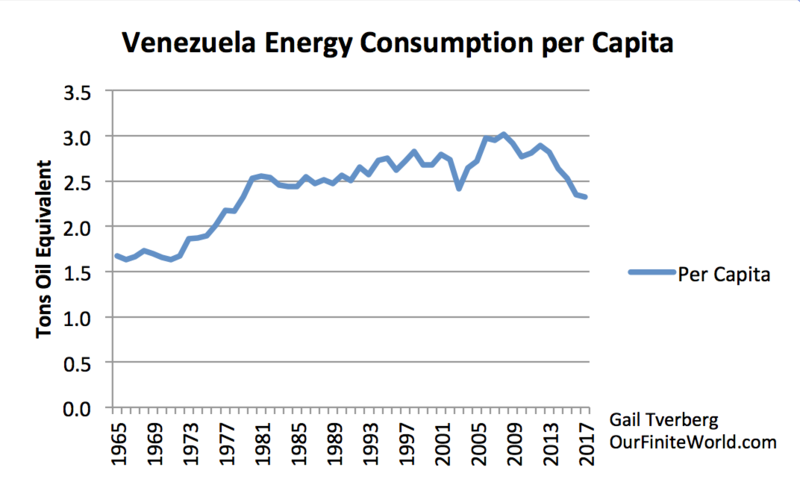 What we see in Venezuela is the impact of conventional oil production peaking. Orinoco oil is not cheap or easy to produce as it does not flow through pipelines. Naphtha or light oil is needed for blending. The funds for developing Orinoco should have been saved during the boom years of conventional oil. “And I believe the history of communism is American history. America owes a great debt to the Red Menace. After all, the threat of Communism inspired us to our greatest achievements. The communists forced our hand on issues of poverty, lest the entire American capitalist project be swept away in a tide of home-grown Bolshevism. They held us morally responsible for our quotidian atrocities. They made us appreciate the arts. They made us stronger and faster. They sent us all the way to the moon. I don’t think democracy is possible without a fairly high level of energy per capita. Governments take energy to operate. The simplest system is simply a medicine man or king or other ruler to be in charge, with a few assistants if needed. More complex economies can be possible with more energy per capita. Having a very diverse economy, with each person having a lot of freedom on what he/she can do, also takes a lot of energy per capita. A teacher can teach much more easily to a group of students who all memorize the same material, rather than accommodating students from many different backgrounds and ability levels. This has to do with how much complexity the economy can have. I expect that quite a few of the atrocities have to do with not enough cheap resources to go around. Killing off part of the population raises the food per capita. The yield on the benchmark 10-year Treasury note fell to its lowest level since January 2018 on Thursday, a day after the Federal Reserve held interest rates steady and suggested it may not need to adjust rates again for the rest of the year. Gail, very good write up on the dynamics of Venuezal and their Public Economic History under Socialism. Makes me feel fortunate to live here in kleptomaniac USA….God Bless America. Disability, ect. My 96 year old Mother went to see her eye doctor yesterday. After a battery of eye tests, ect. Her doctor again suggested having her cataract surgery to improve her sight. She declined because she’s functioning and has other issues. Seems they don’t like that answer. Of course, if she wants it, that’s fine with me. Naturally, we have no clue how much this will cost the Government! Just saying, enjoy the credit card magical spending…it ain’t gonna last. You can imagine how well pension plans are doing with these yields. FedEx (NYSE:FDX) stock is on the investing menu today as the “disaster of the day” and it could take the whole market down with it. The shares are off almost $10 today, or over 5%, after announcing disappointing third-quarter results. CEO Frederick Smith didn’t try to sugarcoat it, calling the numbers “below our expectations.” He promised new investments to lower costs and return to earnings growth. Smith himself said he saw “green sprouts” in the international market, although CNBC called the earnings a warning that global growth is slowing. Costs at FedEx Ground were up as the company launched six-day-a-week service and saw higher gas prices. FedEx International revenues were down, in part, due to weaker international currencies. Global profits were down on lower shipment weights and a customer preference for lower-profit services. Graf said the company is taking the usual responses to slowing business, buying out some employees, limiting hiring, and looking at other cost-cutting measures. When they start laying off employees and mandating pay cuts, we be in deep poo poo. Oh, doom and gloom post of the day. Back to watching “The Price is Right”. FEDX costs for international mail are totally out of sync with the needs and affordability of most people. That is bad for social cohesion and community development across their service area. They don’t seem to lose things, and they’re fast. bUT THEY NEED TO WORK WITH cUSTOMS IN LANDS THAT THEY SERVE. tHEY SHOULD PROBABLY HAVE A CHEAP CLASS THAT TRAVELS BY FREIGHT SHIP. Customs need to decrease their costs too. “New investments to lower costs” seems to equate to capital investments to replace jobs. Ultimately, this leads to few jobs and more wealth for the owners of the capital goods (assuming that the system can be kept going, and earns a profit. If it doesn’t really work, we end up with investment with no real value, especially if international package shipment dwindles, regardless of shipping cost.